This is the second book in the Puzzling World of Winston Breen books. 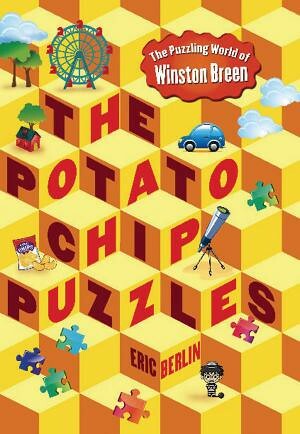 Winston Breen loves puzzles more than anything and he is thrilled when a local potato chip company offers a 6-puzzle challenge contest to area schools with the reward being $50,000 for the winning school. The principal allows Winston to pick his team, so he immediately chooses his best friends Mal and Jake, but their joy is tempered by the principal's pick for chaperone--the competitive, stern math teacher Mr. Garvey. Still, they set off on the day of the puzzle contest with high hopes and the certainly the puzzles are challenging. But then some mysterious things begin to happen--their car gets a flat tire, the sign directing participants to the puzzle is moved...and those aren't the only hurdles. Is someone purposely trying to sabotage the teams? As Winston's team struggles to solve the puzzles, they also find themselves facing another one--who is trying to cheat their way through to victory? Mystery and puzzle lovers alike will enjoy this story--there are puzzles to solve in the book (if you are so inclined) and the action moves along nicely. Fans will look forward to more puzzling adventures with Winston and his friends.